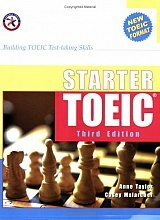 Starter TOEIC Third Edition is designed for beginning level students of English who need to start preparation for the TOEIC. The first chapter introduces students to the twelve most important grammar targets on the TOEIC. The second chapter provides twelve mini tests, each reinforcing a grammar target through natural exposure in a variety of contexts. The third chapter contains a full-length practice test designed to challenge but not frustrate beginning level students.Starter TOEIC Third Edition provides an excellent foundation for students starting preparation for the TOEIC. Key features include: (1) General information about the TOEIC; (2) Tips for taking each sectiion of the test; (3) Clear and precise grammar explanations; (4) Thematic units with integrated grammar practice; (5) A mini practice test in each unit; (6) A full-length practice test; (7) Answer key and tape scripts for all mini tests and the full-length; (8) Audio recording of the listening sections for each mini test and the full-length test.